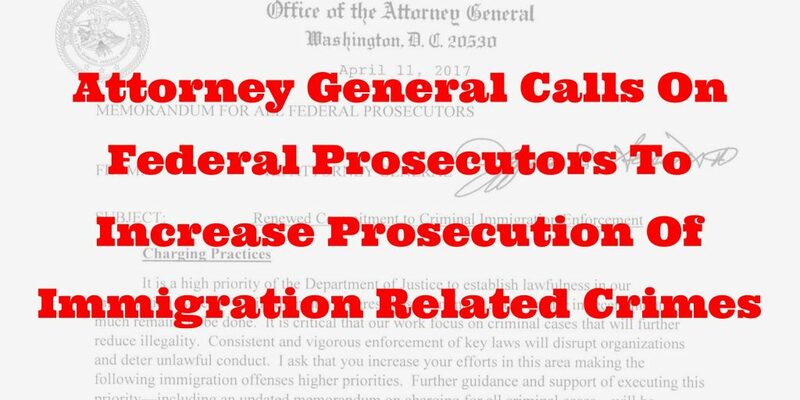 Attorney General Jeff Sessions issued a memorandum (see bottom of this post to read the memorandum in full) to all federal prosecutors today demanding prioritization of immigration related prosecutions. Specifically, he calls for the increased prosecution of 8 U.S.C. 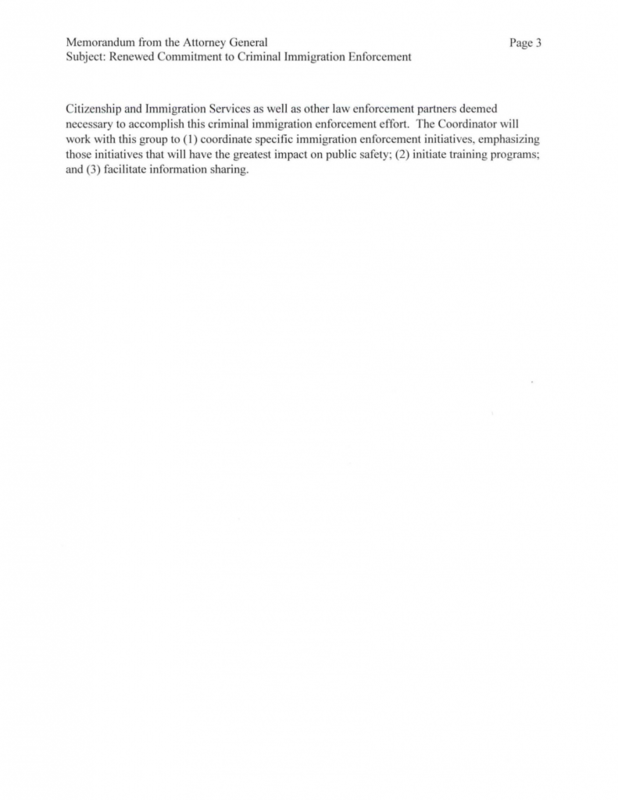 1324 (Bringing in or Harboring Certain Aliens), 8 U.S.C. 1325 (Improper Entry by Alien), 8 U.S.C. 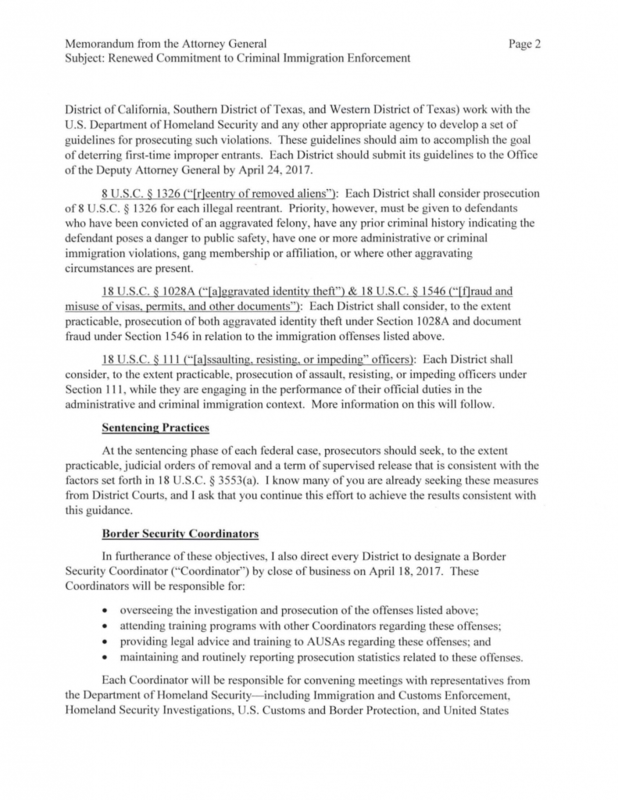 1326 (Reentry of Removed Aliens), 18 U.S.C. 1028A (Aggravated Identity Theft), and 18 U.S.C. 111 (Assaulting, Resisting or Impeding Officers). It remains to be seen what practical effect this memorandum and future memorandums will have on increasing prosecutions. Many critics of this policy fear that increased focus on immigration related offenses will result in decreased focus on other serious federal law violations, including large-scale drug offenses, firearms offenses, and other types of crimes. There also is no indication that increased prosecution of immigration related offenses will decrease the number of people who come into the United States without authorization. Those detained by ICE or CBP already face long terms of detention. Charging those individuals with federal offenses will not necessary increase the amount of time those individuals are incarcerated. The cost of prosecution to the taxpayer will far exceed any positive result relating to enforcing immigration laws. The problem lies in prioritization memorandums like this one. Assistant United States Attorneys across the nation will now not focus on individuals that pose the greatest risk of future immigration violations or future criminal conduct. They will rather use a shotgun approach of prioritizing everyone, which is not only inefficient and costly, but impossible. The government does not have the resources to implement the policies that AG Sessions has implemented. The government does not have the resources to implement the policies that AG Sessions has implemented. AG Sessions has told the Assistant United States Attorneys that further guidance will be forthcoming. That guidance will hopefully focus the Assistant United States Attorneys on a very defined group of individuals who have violent criminal convictions or multiple recidivists. Unfortunately, based on the current memorandum, the net will probably be cast much wider than that, ensnaring people who the majority of Americans would rather not waste their hard-earned money on incarcerating. Our system works best when the people on the front line have discretion to evaluate their cases free from internal pressure placed on them by their superiors. A good case from a bad case. A minor offense from a major offense. A person with a long criminal record from a first time offender. A nineteen year old college student brought to the U.S. when he was three from a drug dealer who entered to profit from drug sales. Memoranda like the one AG Sessions sent out on April 11th put pressure on Assistant United States Attorneys to treat the least culpable people more like the most culpable people. The extremists out there may say that is a good thing. But, no matter where your opinion lies on how wide our doors should open to those on the other side, one reality will always exist. We don’t have enough money to deport everyone. We never will. Using a shotgun approach of trying to deport everyone can only backfire. Not only will this approach not work, it will fundamentally change our national identity. The public face shown to the world is changing from the welcoming face of the Statute of Liberty embracing all to a large ominous wall telling the world to keep out. Certainly, we must enforce our immigration laws. And if there is a violation of those laws, there must be consequences. But just like in criminal law, there is discretion. Not everyone who is discovered to commit a crime is arrested. Not everyone arrested is prosecuted. And not everyone who is prosecuted is incarcerated. Prosecutors and judges use their discretion to wade through all of the information to prosecute and sentence those who commit more serious offenses, recidivists and those with aggravating factors more severely than others. The same should be true in immigration.